Want to keep yourself and your family clean and free from germs, buy this Ohuhu® Touch-Free Soap Dispenser! This item has a built-in infrared smart sensor, automatically output soap once laying your hand, dish, etc. Promote and easier hand washing while avoiding germs and bacteria that live anywhere people lay their hands. The low, middle, Large amount of liquid is dispensed simply by one press circulation, so you will never have to worry about your hands coming into contact with anything harmful. The 16.9 fluid ounce/500ml container is the perfect size for almost any location, including kitchens, washrooms, garages and more. To live a healthier and easier life, you cannot miss this Ohuhu® Touch-Free Liquid Dispenser! This is a great looking soap dispenser. It has an attractive, sleek design and I love the silver. It looks great in my kitchen. I decided to put it in my kitchen for one main reason... when I'm cooking! Especially, when I'm dealing with raw meat, it's nice to be able to get soap and not have to touch anything with my "yucky" hands. 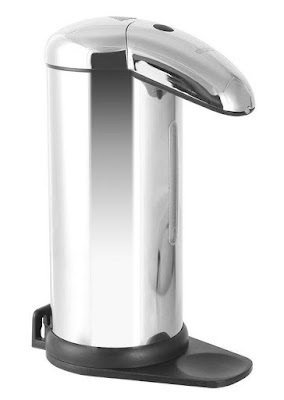 This Ohuhu® Automatic Soap Dispenser uses 4 AA batteries (not included) that are placed at the bottom of the unit. The on/off switch is located at the top of the unit and all I have to do is press it for a few seconds to either turn it on or off. The green light will turn on when it's on and red when it's off. The sensor works great and the soap is automatically dispensed when I put my hand underneath it. *Note* Sometimes the sensor can be a little sensitive, so be careful when you have to pick it up when it's on. I found out the hard way when I went to pick up the unit and the soap came out onto my kitchen counter. Adding the soap is easy too and I like that I can load it with any kind of liquid soap. The top simply comes off revealing the filling hole. It also comes with hardware to mount it on the wall, if you choose to, but I like mine next to the sink. Now, do remember that this unit uses batteries and cannot be submerged into water. The direction do state to wipe it clean with a damp cloth. I have mine near my kitchen sink, but off to the side a bit so I won't accidentally hit into a sink full of water. Overall, I really like this product! It works exactly as it is described and I'm very satisfied. I would definitely recommend this product. If you would like to try these out for yourself, you can purchase these Ohuhu® Automatic Soap Dispenser - Stainless Steel Kitchen Touch-free Sanitizer Dispenser with Wall Mount - 16.9 Fluid Ounce / 500ml right now from Amazon!